The wife and I decided that we should finally follow through on getting matching wedding rings since we finally found a designer that we both really like. 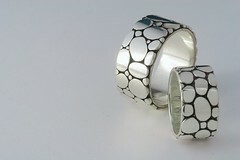 The designer is John Hardy and the rings are fantastic. Its significantly larger and heavier than my old one, but with much much more character. Much better than a traditional band. Much more interesting. More images over at my Flickr photostream. Older Search and replace directly within MySQL.